I must admit I have never considered myself a feminist. There was always something about the interpretation of the term that I couldn’t relate to. I have always found it difficult to be treated as inferior, as the victimized sector of society (though I have never been oblivious to unjustifiable favoritism on the basis of gender). The fact that feminism represented something against femininity, against men, something revolutionary in terms of women's evolution, trying to convince us that we should forget how we were raised and even some of our inborn inclinations, well, all this just put my "mother nature" instincts on alert. And yet, as said before in Fashion and Feminism and in Take a Stand – Prove a Point, extreme definition and radical actions are always needed in order to create a significant change in the way we perceive things. It is strange to think of it nowadays, but just imagine that up until 90 years ago woman didn’t have the right to vote and until 150 years ago women didn’t have access to higher education. The feminist movement has been a vital force in fighting for these major historical social changes which have allowed us all a better life. However, now that progress has been achieved, we are also aware that the mission hasn’t been accomplished! In Accelerate the Global Gender Parity Clock you can read more about the goals that are still ahead of us and that, according to current research, it will take another 80 years until we achieve global gender parity in the workplace. 2095 – that is a long time! Most of us will not be around to see the day! Another 80 years, however, in the mirror of history, sounds just around the corner, doesn’t it? Trying to travel back in time, I often contemplate the enigma of why and how these gender differences came about in the first place. When, where and why were the seeds of prejudice sewn? What was it exactly in the evolution of humans that set the stage for this troublesome path of gender inequality? You could say it boils down to one single word: power. Or to elaborate: power, ego, and control. Well, guess what, physical power is no longer a major component for superiority, be it in daily life or even in war. We no longer hunt to eat or fight to ensure our physical security. Battles, except perhaps in the abhorrent cases of terror, are being won by other means such as strategy, cunning, and technology. With technology on your side, physical power is no longer a factor, and thus ego and control ought to be dispelled from any interaction between the sexes. Yet, in order to make sure that we do eventually get there, hopefully in less than 80 years, there can be no solution without the involvement of both men and women. As suggested by others, both genders must join forces to fight for the advancement of women, but not them alone. Bell Hooks, the well-known feminist and social activist, among others, argues that the feminist campaign must also include men's liberation as men too are harmed by traditional gender roles. 200 years have passed since the Industrial Revolution sent large numbers of Western women into the workforce. And while such great progress and accomplishments have been achieved thus far, the abundance of work yet to be done makes me wonder whether it isn’t time to rethink the definition for the changes and objectives still in the making. A definition that will represent not only women but will speak for and represent the objectives of both genders. Feminism has had its successes but has left us with some poor consequences: women fought for a career only to end up with two— one outside of the home and one inside; we demanded our right to self-fulfillment only to be stuck with impossible pangs of conscience about not being home enough or sufficiently attentive to our children’s needs; we voted for feminist manifestos which discouraged beautification and adornment only to become victims of a more sexist culture whereby even influential women in show business, for example, exploit feminist images in extremely provocative and seductive settings, and so the list goes on. I personally was always the first to brush off the feminist agenda, simply because I rejected the need for any special treatment. I always alleged that there should be no free passes just for being a woman, believing instead in determination and equal opportunities as the only relevant factors for prioritizing our choices. However, as I have come to understand, reality and life are not a theoretical argument; they are a drawn-out daily struggle to combine family, career, and relationships. Whether we like it or not, this combination requires us to eventually surrender one or more of our responsibilities. And while I still believe that it is for us to make our own choices, I am also aware of the objective hurdles that cannot be ignored. Maybe it is time to choose a new term which will represent, announce, and emphasize the importance of gender equality, equal responsibilities and the elimination of any antiquated gender roles. 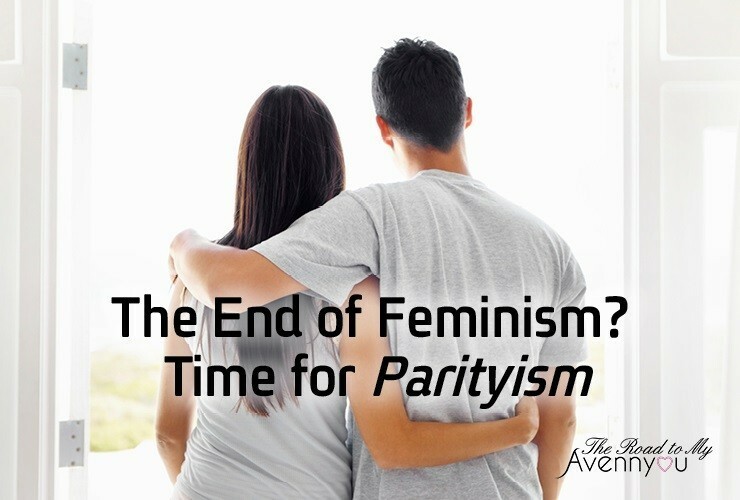 Instead of feminism we could call it impartialism, equalism, genderism, or parityism. Parityism is about men and women, representing both genders working together for the same cause, namely, the realization of the right balance in life, while adhering to their own personal dispositions. Women should no longer need to find their way in the male denominated world of economy to prove they can make it. They will feel good about themselves within newly emerging feminine lines of productivity without the need to apologize for their choices. And, likewise, men will be able to choose a gentler occupation without being judged or questioned about their sexual preference. It is about both genders cooperating to realize their potential and attain self-fulfillment while also playing a significant role in establishing and building a family. Men should have the right to spend more time with their family and be attentive to their needs and not only as the economic provider, and in doing so not be judged by this macho brotherhood which asserts that their behavior is unmanly and that they will all have to pay the price if some of the guys go sissy. As expertly highlighted in the EY research shared in the post here, it should be the aim of both men and women, from awareness that this change benefits not only half of society but rather all of us in terms of the economy, the family and the individual. In order for real equalism to emerge, major behavioral changes must be assimilated into our daily lives. Letting go of old habits, prejudices and power games are key for providing future generations with a better starting point and an agenda of parityism for us all.